Wisdom of Life. : Sedikit-sedikit lama-lama jadi bukit? It was raining and I had to run to my car because I needed to meet another appointment. When I was about to open the car door trying to rush myself in, I noticed there was a five cents coin just outside my car. In the car, I wondered whether I should open the car door again to pick this coin or not. The road was wet and muddy. If I go out again, I was sure I would get wet much more. Pondering and more pondering inside the car, came the memories of my late mother's advices. When I was a small child, mother said... "Is a sin not to pick those coins fell over the roads. Whether is the one cent or lesser, son, you must pick it up!" Her vision striked my thought! Though the five cents has really no value of today when one could not buy anything with it, I told myself I still had to take my mum's advice. Immediately I opened the car door, got myself wet and picked up the valueless coin from the muddy ground. Back in the car again, I felt so relieve and happy, when I murmured to myself... "Mum! Thank you for teaching me the value of life." This five cents coin is still in my car compartment. Today if we were to walk around town, one could easily see plenty of the five cents and ten cents coins on the roads. No children would be bother to pick them up. Because to them these coins are valueless and they are not taught with 'the value of money' in the first place. In our Malay Language, there is a proverb which said, "Sedikit-sedikit lama-lama jadi bukit." In literal translation, it means "Bit by bit, over time, it will accumulate into a mountain. This proverb is one of my philosophy of my life especially in my financial planning. Our parents used to tell us to save money for our future even though in small amount. Now I realize that the advice of our parents is so important because the saving now has become a big amount. Now I also educate my children to save money, especially 'duit raya' they receive during Hari Raya for their future as well. Our parents' advices won't be wrong. Be good parent to your children now brother. Chinese have a belief that if one picks up a coin from the road, it means picking up bad luck of other people that dropped it. However, if we pass the coin through the middle of our legs, it will get rid of the bad omen. You might say it is superstitious, but there's always a reason elder generation had such belief passed down till today. 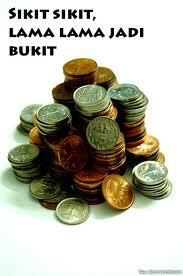 While from the economy point of view, a 5 cent coin value is more than a 5 cent. The coin will be passed down to company A and from A to B, B to C, etc. In between all these transaction, every company recorded an additional 5 cent in their account books and eventually increases the total GDP of our economy that might comes up to a huge amount. Hence, a 5 cent missing hurts a country's economy a lot. Of course, it will also affect many other factors; so I would like to say thank you for rescuing the 5 cent. Superstitious or not, picking up the 5 cent is a good deed. Yes! What you said was true that whenever we picked up a coin from the road, our mum always insisted that we had to pass the coin through our middle of our legs to get rid of the bad omen. Till today, believe me I'm still doing it. Coz I'm a good son of my mother. Should have added this point on the posting ah? Haha. From the way you shared and with this beautiful name of Michelle, I think i more or less could guess which arena of time you were born. Must be a mother and wife by now with some grown up children too. Please don't get offended!